Reflections on Faith and Culture: Can this be true? The Vatican Museum is of course too vast and too filled with great treasures to be absorbed in one visit. Liz and I had made two trips to the museum on our last trip to Rome a year and a half ago. This time we arrived at the museum too late in the day to do much more than see a fraction of its masterpieces. With the Cornerstone Forum’s “Emmaus Road Initiative” never far from my mind, I was taken by an especially fascinating tapestry among the truly stunning tapestry collections the Vatican houses. It is a tapestry from the Brussels workshop of the Flemish artist Pieter van Aelst dating from the middle of the 16th century. 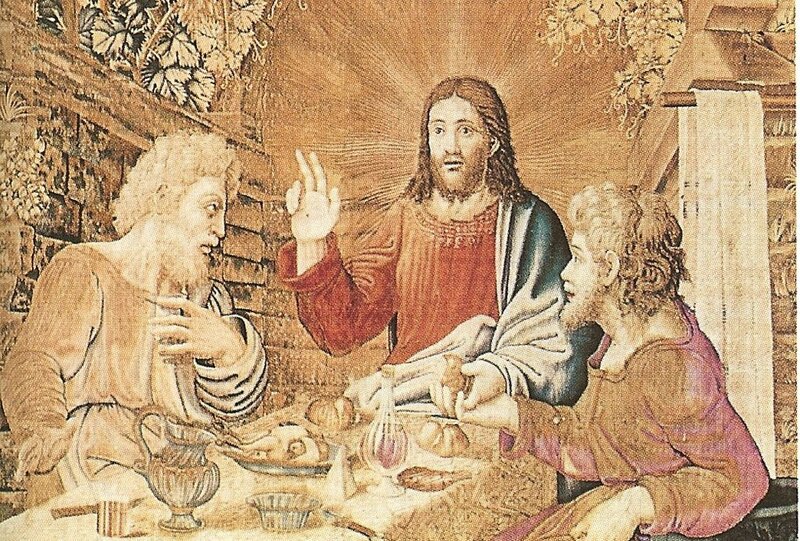 It depicts the moment when the two disciples with whom the risen Christ walked on the road to Emmaus recognize him in the breaking of the bread. It is a very large tapestry, and the artist has depicted the two disciples in what appears to be a social hierarchy: the elder man on the left of the tapestry and a younger man slightly below him on the right. I was struck by something about which I will make more extensive comments in a subsequent post, namely, that Christ is looking at neither of the disciples, but rather he has his attention on something – or more precisely some One – else. Whereas Christ is exclusively constituted by, and consubstantial with, his heavenly Father, his Christian disciples depend on one another, that is to say, on the Church – the fellowship they have as a direct corollary of their newborn faith. What most fascinated me is the expression on the face of what appears to be the younger disciple on the right of the tapestry. He looks, not to Christ, but to his friend, his eyes asking in the most childlike way: “Can this be true?” If not, as Paul insists in the most unambiguous way, our faith is folly and lives lived according to it ridiculous.